Yesterday was a good day. It wasn’t an exceptional day, just a really good day. An exceptional day might be one where you get married or have a child. An awesome day could have a a presentation you nail at work, a vacation day on a perfect beach, a big event you’ve waited for, even a rare date night with your wife and friends with no kids. A good day is one where daily occurrences happen but you recognize the importance that they hold. One of my friends got a group of us moving and on our mountain bikes before impending rain was scheduled to hit. Even with some last minute miscommunication, everyone got to the trails roughly on time and nobody stressed about it. Of the 6 of us, some are in awesome shape, one’s been off the bike for months, I’ve been traveling a ton for work and fall somewhere in between. Somehow all of us stayed together without blazing ahead or falling back. And when one of us needed to fix a flat, we stopped and joked about Muppets and whether Leaving on a Jet Plane is more associated with John Denver or Peter, Paul, and Mary. #monopolyshit was given and received. 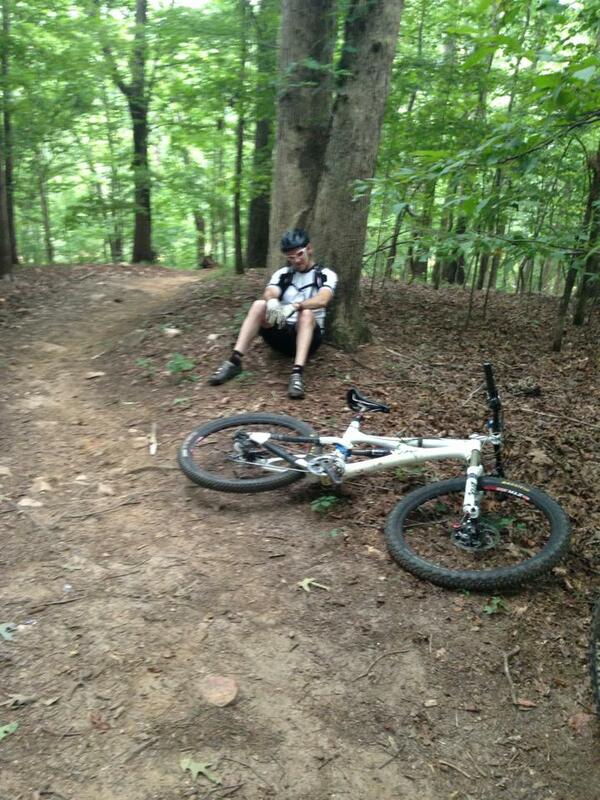 The trail my friend flatted on ends by a stunt-filled downhill run that’s closed now. Another friend is an RN at a spinal center and remarked that he has a patient who crashed on the run and is in a wheelchair now. When I remarked how rough that is, he said “No, it’s just not what was expected”. Later, we went out to lunch as the rain started to fall. Amongst talks about kayaks, iOS 7, and 3D printers, the RN revisited his work some. Sure he has people who’ve been hurt on bikes, in cars, skydiving. He also works with patients who have slipped on stairs and fallen or of bed. For all of those people, life is now a choice between giving in to the unexpected or moving on from it in a new normal. Their definition of a good day may be changed but an exceptional day could just be wiggling a toe. He gets to work early and attacks every day to help people adapt and have good days. Even this tired, Nino had a Good Day. I went home and hung out with my family. My wife and I cooked dinner. I played games and joked with the kids. We had an evening devoted to comfort food and a slow pace. Again, nothing exceptional. Just good. So what’s a good definition of a “good day”? I think it’s one where you go to bed feeling at home with yourself and that just about everything you’ve done reenforces your sense of who you want to be. A day where you feel like you’ve cashed in on who you really are and are happy with the outcome is certainly a good day. A good day indeed; love you brother. Your good days inspiring others to have their own good days is…. inspirational.